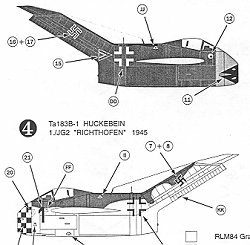 The Ta-183 was the winning design for a second generation fighter for the Luftwaffe. Unlike earlier production jets, the 183 was a single-engined aircraft. Earlier designs had been twin-engined for two reasons. One was that the engines didn't produce a huge amount of power so two was needed to give the performance required. The second was that early turbojets were not very reliable and the second engine was needed to ensure that the pilot could return to base! With the advent of improved engine design, the need for a second engine was not seen as a requirement. The He-162, which was sped into production, had shown that one could have a single engine and still have reasonable performance if placed into a small enough airframe. The 162, however was not a quality aircraft and had numerous faults in design and construction. 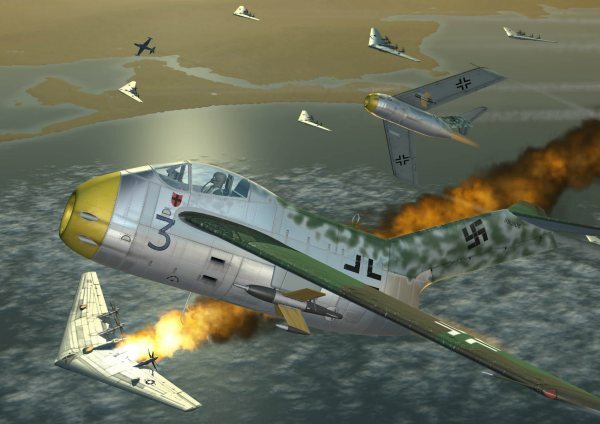 It is lucky for the pilots of JG 1 that they never really had to take the planes into combat! 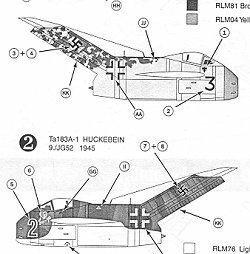 Focke-Wulf's Ta-183, however, was a much more polished design. It was designed to take advantage of several engine types; either Heinkel's HeS 011 engines or the Junkers Jumo 004 design. In addition, it was also able to carry a quartet of the new air to air missiles; the Ruhrstahl/Kramer X-4. The X-4 was a wire guided missile that was designed to spin at about 60 rpm in order to overcome any construction defects and to assure a rather steady track. It was designed with both an impact and proximity fuse that could detonate its 20kg warhead. Range was about 5.5km (as that is how much wire each carried) though attacking aircraft were expected to get closer than that to assure a hit. Control was via a joystick in the cockpit. In addition to being able to carry the X-4 missile, the Ta-183 could be built as a fighter-bomber with a shallow bomb bay that could carry either a small bomb or a drop tank. This bomb bay was not fully enclosed, but only a partial recess so any load would only be semi-enclosed. Normal armament for the 183 was to be two or four Mk 108 30mm cannon. With only 2 cannon, ammunition load could be increased from 80rpg to 100rpg. However, like many late war projects, the Ta-183 never was built, and not even a full wooden mockup was completed as the deteriorating war situation prevented it. When the designer, Kurt Tank emigrated to Argentina in the late 1940's he had hopes of building the Ta-183 there, however, his design was altered to form the Pulqui II, which had a high mounted wing instead of the center mounted wing of the 183. Other detail changes were made and from all reports, this made the plane dangerous to fly. Fortunately for Argentine pilots, only a small number were completed. I need to point out at the beginning that this kit is a test shot and as such may be changed before final production standards are reached. However I can tell you that this will be a sweet kit when it hits the streets. Looking at the sprues you can hardly believe that this is a first kit. The overall level of detailing and quality of the molds would have you think that you are looking at a Tamiya or Hasegawa kit. Test fitting the pieces only adds to this impression as the fit is excellent. 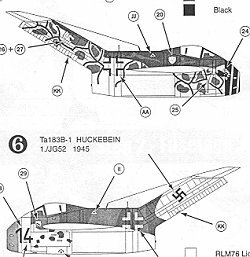 Panel lines match from side to side and several assemblies, such as the cockpit and exhaust, have positive alignment features. There are several options available with the kit. One is for X-4 wire-guided missiles. Another is separate exhaust sections for either the HeS 109-011 or Junkers Jumo 004 turbojet. You also get the shallow bomb bay and a drop tank to fit into the recess. No bomb is given, but I'm sure you could find one in your spares bin if you had to. Wheels are flattened, but not bulged and there are actuating rods for the main gear doors. The cockpit is superbly detailed with all that one could want from a kit of this type. The canopy is a single piece, though you could easily cut it open to display the cockpit if you wanted. I took a close look at the bits and again, I must remind you that this is a test shot so what I found may not be present in the final production kit. First of all, the canopy is nicely done. My example was scratched due to bouncing around in a bag with the other bits but this should not be a problem with production kits. A Future bath should take care of that. There were also some ejector pin marks on several pieces. I found them on the inside of the gear doors, on the main landing gear, tailplane, main wheels, and on the wing pylons. The only ones that you may have trouble with are the ones on the inside of the gear doors, however they really won't be that visible once the kit is built. The others are easily removed with a touch of sandpaper. Naturally, I was most eager to build this kit. Even without instructions, it should be pretty straight-forward. The general look and feel of the kit is one that I'm sure you will truly appreciate once it hits the market. 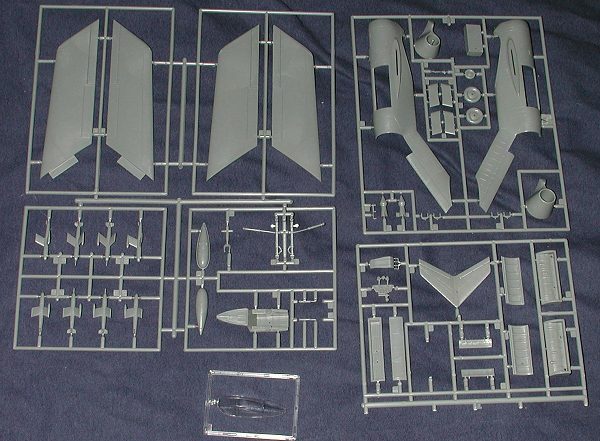 Retail price will be $39.98 and that is what similar Eduard and Classic Airframes kits are retailing for. This kit is MUCH superior to any Classic Airframes kit in terms of fit and is even better than recent Eduard releases in that regard. Plus you don't have to mess with resin or vacuformed or etched metal parts! I can tell you that the kit builds just like a Tamiya one and you'll love it. Overall, the kit is an incredible piece of engineering and detail. The folks at AMtech are not new to this and come from various places in the industry. I look forward to seeing other kits from these folks and encourage you to support them in their efforts to bring you kits of this quality (that means go out and buy them!). Once you see and build one I think you'll have to agree that a new player is in town! 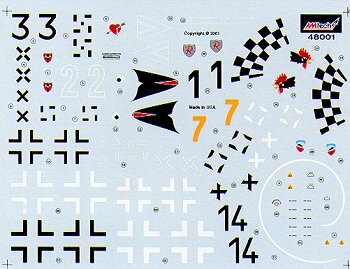 Decal sheet and camo diagrams added. Thanks to for the review sample.